Princeton’s reunions are almost as old as Princeton University itself, going back to the days when the university was still known as the "College of New Jersey." In today’s blog, posted during the Reunions weekend of 2011, we are showing you the oldest reunion footage in the University Archives: an annotated film of the Class of 1895’s 20th and 30th Reunions in 1915 and 1925, followed by footage of the Class of 1915’s 40th Reunion in 1955, and the Class of 1944’s 65th Reunion in 2009, the most recent reunion footage in the University Archives. 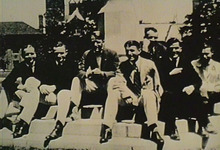 The films may be compared with reunion footage featured in previous blogs, including the Reunion of the Class of 1921 in 1923 and 1926, and the Reunions and P-rade of 1928, of 1960 and 1961, and of 1986. A compilation of this footage to welcome returning alumni in 2011 can be found here. Back at headquarters at the Bachelor’s Club, we see a crowd of men and children gathered around class member Howard Colby’s “‘sarsaparilla automobile,’ built, decorated and provisioned with thoughtful consideration for the small army of sons and daughters” of class members (2:23). 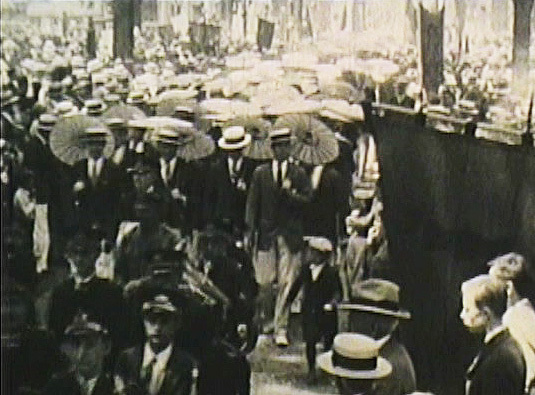 As the film winds down, the camera pans over the 136 class members who returned for 1895’s 20th along with their sons (3:53). The D.Q. Brown Long Distance Cup is presented by Dickinson Brown to his classmate Henry “Spider” McNulty, who traveled the farthest, from China, to attend the reunion. From the start of the Depression until the end of World War II, construction activity at Princeton, like at other universities, was at a near standstill. The first buildings to be erected here as part of the post-war building boom on American campuses were the Dillon Gym and the Harvey S. Firestone Memorial Library. The four silent films discussed on this post, which are all in color, capture the beginning of the construction of Firestone Library, the dedication of the Dillon Gym in June 1947, and other activities at the close of the bicentennial celebrations of 1946-1947 and the immediate years thereafter. The origin of the 16mm film that is featured here is unknown. Although it seems excruciatingly slow at times, the 14 minute long time lapse footage spans almost one and a half years, during which the excavation work for Firestone Library was undertaken, the structure of the three underground floors almost completed, and the steel structure of the upper part of the library erected. 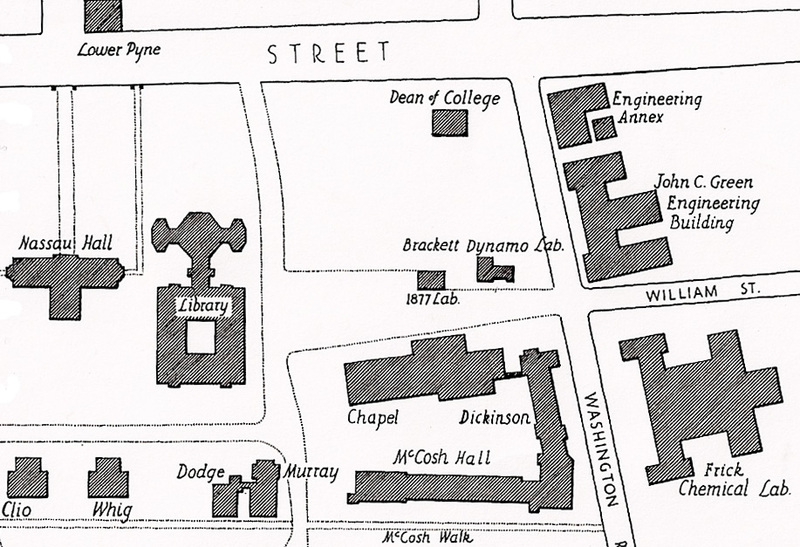 As can be seen on this campus map, the space between Washington Road and the then library (what is now Chancellor Green and Pyne Hall) was quite open. 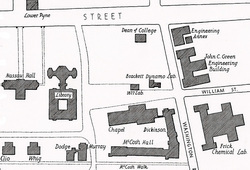 During most of the film the camera is facing the Engineering Building on Washington Road (now Burr and Green Hall), and moves between the Joseph Henry House, home of the Dean of the College (the white house seen on the left) and the ’77 Laboratory (the square brick building with the crescent shaped windows on the right). This biology laboratory, donated by the Class of 1877 at its tenth reunion, was demolished in the summer of 1946, which is captured starting at 9:15. The ’77 Lab appears as a pile of rubble at 9:21, when the Bracket Dynamo Laboratory behind it becomes visible. This second lab is gradually broken down in the footage that follows. The Joseph Henry House, however, was not destroyed but moved instead, for the third time since it was built in 1837. Although the camera focused on the excavation work, preparations for the move to its present location, which according to the Prince started in April 1946, can be followed from 8:40 at the top of the screen. The actual move took place at the end of May, and the house can be seen to have moved a few yards between 9:45 and 9:48. Most of the footage concerns the digging and excavation work prior to the construction work, which had started on Christmas Eve 1945, and was subcontracted to George M. Brewster and Sons (Turner Construction Company was the contractor). The work of Brewster’s “blasting crew,” which according to the Prince in March consisted of a “blast expert,” a “powder monkey” and twelve drillers, can be followed from 3:28, with two explosions visible at 4:35 and 6:48. Only the last few minutes of the film (10:39-14.15), capture the beginning of the construction of the Firestone Library itself, starting with the lowest floor. The snow at 11.31, surrounding the concrete columns, indicates that a year has passed since the time lapse filming began. On January 15, 1947 the Prince wrote that most of the underground structure had been completed. The footage at 11.53, which includes a view on Nassau Street, must have been filmed during or shortly after February 1947, when the library, according to the Prince had risen above the ground. The film ends with footage of the building of the steel structure of the library’s three floors (13:11), the last shots of which indicating that it is springtime now (13:32). In the 1946-1947 academic year, Princeton celebrated its 200th anniversary with a series of convocations and events, ending with a concluding ceremony, captured in a newsreel, which included a convocation address by US President Harry Truman. Today’s blog features another newsreel about the University’s bicentennial year that focuses on “Charter Day,” October 19, 1946. 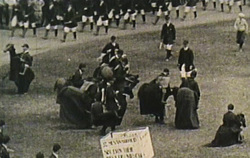 In addition to Princeton’s almost 200-year old charter and the “largest procession in Princeton history” at the time (which included 23 honorary degrees recipients), the newsreel addresses the beginning of intercollegiate football, depicting a re-enactment of the first football game between Princeton and Rutgers from November 6, 1869 during halftime of the 1946 Princeton-Rutgers game. Princeton’s charter, granted to the University on October 22, 1746 (then still known as the “College of New Jersey”) is shown fleetingly in the newsreel (0:38). Readers of our regular blog already know that the charter, on intermittent display during the celebration of Mudd Manuscript Library’s 50th anniversary, is actually not the original (which was lost) but the second charter, drawn up in 1748. (An explanation can be found in our Frequently Asked Questions.) The famous early picture of Nassau Hall that follows at 0:48 is the copper engraving by Philadelphia artist Henry Dawkins (copied from a drawing by Princeton student William Tennent, Class of 1758), which was printed in Samuel Blair’s Account of the College of New Jersey (1764). For more information about the engraver, who was also a counterfeiter of paper money, see Julie Mellby’s Graphic Arts blog. Over 500 people comprised the academic procession that opened and closed the morning’s convocation, according to the Prince, including faculty, trustees, representatives of all alumni classes and members of the Undergraduate Council. The procession included an official delegation from the United Nations, headed by Secretary General Trygve Lie, and members from the State Bicentennial Commission, including Walter E. Edge, Governor of New Jersey. Lie (1:42) and Edge (2:11) were among the 23 honorary degree recipients, as were the Danish physicist Niels Bohr, the Spanish writer Salvador De Madariaga, and the French philosopher Jacques Maritain (2:21–not all recipients are clearly visible). The last eight minutes of the newsreel are occupied by the 38th Rutgers-Princeton football game in the afternoon (2:47), with a humorous reenactment of the first Rutgers-Princeton game of November 6, 1869 (5:51), considered the ‘birth’ of intercollegiate football. A description of the football game and the reenactment by Theatre Intime and members of the Rutgers soccer team can be found in the Prince. A copy of the program notes about the 1869 football game, with an explanation of the rules, may be downloaded at Twenty-four Stalwart Men.pdf. A second article from the program, summarizing the history of the Princeton-Rutgers football rivalry, can be viewed at 77 Years Princeton-Rutgers.pdf. More information about early football can be found in Football: the Ivy League Origins of an American Obsession by Mark Bernstein ’83, who wrote our previous blog entry. The footage on this 16mm film is part of the University Archives’ Historical Audiovisual Collection (part of item no. 0092). As a bonus there is footage of the Class of 1928’s freshmen ‘flour picture’ from 1924–the first in many years in which only water and flour were used, which apparently made this hazing tradition too tame to survive–it was abolished in 1926. According to the list of class films in the records of the Graduate Council, the Class of 1928 had three film reels capturing their commencement, with some of the footage similar to the graduation film of the Class of 1921. The footage featured here contains only a few scenes, without the titles that originally accompanied them. The film, which is not in chronological order, opens at the end of the class exercises on Monday, June 18 with the breaking of the pipes on Cannon Green, which symbolized the breaking of ties with undergraduate life. The footage is followed at 0:22 by the commencement exercises on Tuesday, June 19, ending with the singing of “Old Nassau” (0:44). The film continues on Saturday, June 16 in front of Nassau Hall (0:54), where all alumni were waiting for the Class of 1928 to lead the P-rade. 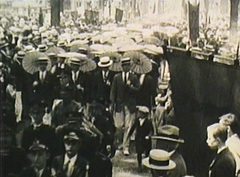 After the arrival of the 466 graduating seniors, carrying white umbrellas (1:04, left), the other classes would join in, beginning with the youngest. The footage at 1:16 shows various classes coming through the Arch at Prospect Avenue, from where the procession proceeded to University field. From 1:30 the procession is seen marching around the baseball field, prior to the traditional game against Yale. The cameraman zoomed in on classes with particularly interesting costumes. These include what is thought to be the Class of 1918 with feather hats (1:39), and an unknown class (possibly the Class of 1912) acting out a fox hunt (1:59, right). The film ends with footage of presumably the Class of 1928’s last Senior Singing on the steps of Nassau Hall (2:19), with the seniors traditionally dressed in white. Among the earliest silent films that were shot on the Princeton campus are those produced and financed by the classes of 1921 to 1939 (see our previous blog). The first true ‘class film’ was titled “The Class of 1923–its deeds and its antics.” A compilation of footage from this film and of the film “Champions 1922,” with football highlights of the fall of 1922, survive in the archives. Be ready to watch the “football team that wouldn’t be beaten,” the building of a championship bonfire, a dirty flour fight, Triangle chorines and more Princeton lore. The two 16mm film reels on which this footage was found contain almost all scenes (though in different order) of the original nitrate base films that were kept by the Graduate Council. According to the Graduate Council’s lists of captions or “titles” of the films, the original “Champions 1922,” which was rented out to alumni groups, took up one reel, and the film with the class’ “deeds and antics” took up six. Portions of six of the seven original reels were used, with only the class’ commencement scenes omitted. Princeton’s three football victories that clinched the championship in the fall of 1922 are found at separate places: the Yale game (November 18) at 0:00, the Harvard game (November 11) at 3:18, and the Chicago match (October 28, 1922) at 11.42. 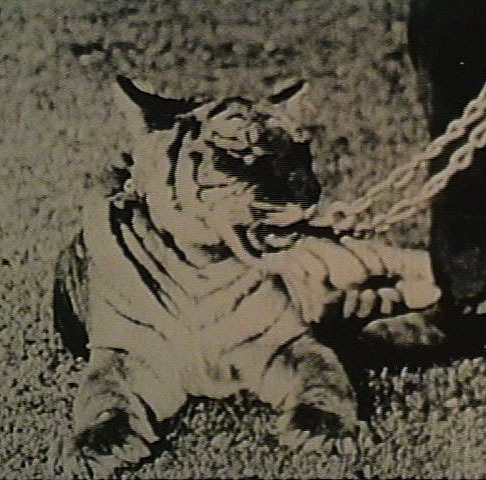 The film features a live tiger cub (2:33) that, according to the note found with the film reel, was donated by the father of one of the players “since Princeton won (the) Harvard game.” An article in the Prince identifies the donor as J.F. Howard from Haverhill, MA, father of Albert “Red” F. Howard ’25, who had caught the cub while hunting in the jungles of India. The note indicates that the tiger was given to Philadelphia Zoo after graduation. To our surprise, we had already seen the bonfire footage at 4:22. It was featured in Gerardo Puglia’s 250th anniversary documentary and was thought to be the championship bonfire of 1926 when it was put online by the Princeton Alumni Weekly. Now we know that it was actually the championship bonfire of November 21, 1922. Given the caption on 1923’s Class film, it is easy to understand the mistake: it was traditionally the task of the freshmen (in this case the Class of 1926) to find wood for the celebratory bonfires. That this involved quite a bit more than gathering brushwood is demonstrated in the film. A photo montage of the events can be found in the Daily Princetonian of November 25, 1922. The title that accompanied the original footage apparently was removed: “Flour (?) picture: 1926 undergoes its baptismal rites.” The question mark indicates that more than flour was dumped during this hazing ritual, and a year later, the Class of 1926, now sophomores, added their own special ingredient to the mix: acid! Not surprisingly, the flour picture was abolished immediately. The Prince wrote solemnly: “This action was necessitated by the degeneration of the Flour Picture in recent years until this fall it was a distinctly non-Princeton affair.” A later article detailed what may have been mixed with the flour on this footage: eggs, tar, paint, molasses “and whatnot.” The flour picture was reinstated in 1924 with water and flour only, but the interest of the sophomores waned, and the practice stopped after 1925. The photographer of the flour picture is probably Orren Jack Turner, who appears at 6:28, followed a bit later by B.F. Bunn ’07 (6:36), manager of the University store and financial adviser to many campus organizations, who advanced the money for the camera purchased by the Motion Picture Committee. The footage of Bunn is followed by scenes from the Triangle show “The Man from Earth” (6:46), the annual show for 1922-1923, with Wally Smith ’24 in the title row, singing “That’s why I left the world behind” (7:36). This is the earliest Triangle footage in the University archives, preceding even the footage of “The Golden Dog” of 1929 that was featured in a previous blog. The remainder of the footage includes athletic teams and training sessions, as well as class officers and members of the boards. Sports featured include soccer (1:21, 5:28), cross country (2:15), baseball (7:49. 14:31), rowing (8:25. 17:33) and golf (16:12), while footage of construction of the Hobart Baker ice hockey rink can be found at 6:42. The footage includes members of Theatre Intime (14:00) and the board of the Daily Princetonian. The latter footage captures another Princeton’s tradition: the privilege, exclusive to seniors, to sit on the steps of the Mather Sundial, in the center of McCosh Courtyard (16:44). This footage on this 16mm film is part of the University Archives’ Historical Audiovisual Collection (item no. 0195 and 0196). This post contains the oldest newsreels present in the Princeton University Archives. As discussed in our previous blog, Princeton University started making films in 1919, using the footage for its first promotional film in 1921. For earlier years, however, it was dependent on newsreel companies like Pathé, which filmed newsworthy stories and items of topical interest for movie theaters. 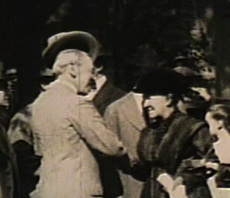 The first film documents the inauguration of John Grier Hibben, fourteenth president of Princeton University (1912-1932). 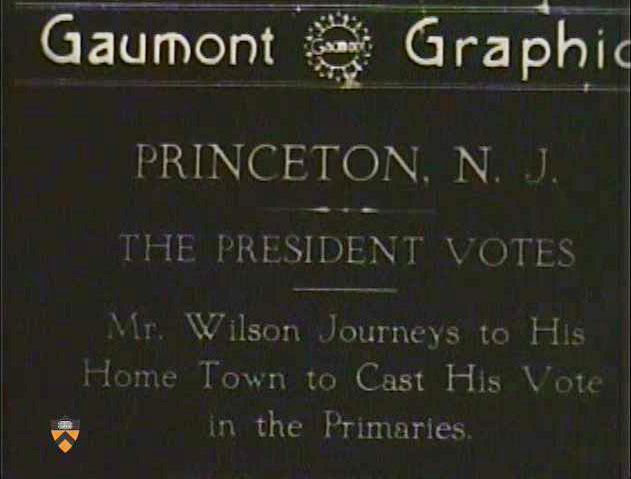 The newsreels that follow show US President Woodrow Wilson, Hibben’s predecessor, when he returned to Princeton to vote in 1913 or 1915 and in 1916. We do not know what company produced the silent newsreel about Hibben’s inauguration in 1912 as only the opening titles survive, but it is obvious what made the issue particularly newsworthy: William Howard Taft, President of the United States 1909-1913, was a guest at the ceremony. 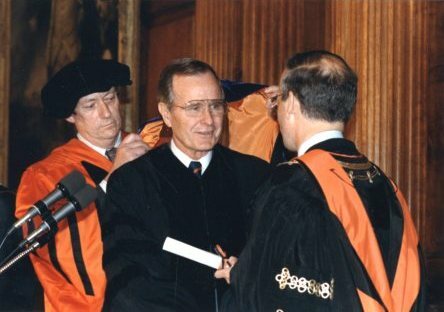 He received an honorary degree, along with US Supreme Court Chief Justice Edward Douglass White. The newsreel opens with Taft posing with Hibben and his wife and daughter at Prospect House (0:14). It continues with Hibben and his distinguished guests, headed by Grand Marshal William Libbey ’77 and Taft’s personal aid, walking past faculty, trustees, students, and guests on Cannon Green, from where the procession marched to Nassau Hall (0:54). The Daily Princetonian describes the procession and following exercises in detail. 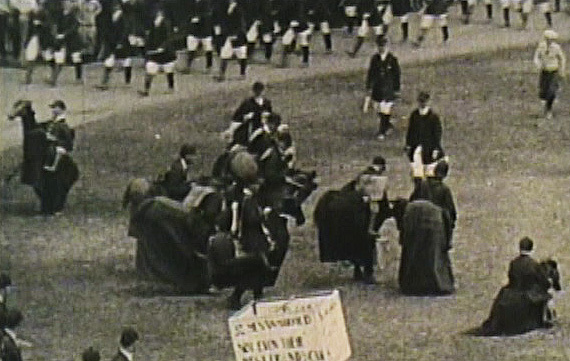 The newsreel footage, however, shows very little of the ceremonies on the podium in front of Nassau Hall. Hibben’s inauguration and speech are shown at 1:36, followed by the conferment of honorary degrees to Chief Justice Williams (1:51) and President Taft (2:04). The very brief footage tha t follows at 3:15, showing Wilson greeting women, was taken when he voted in the NJ primary on April 25, 1916. 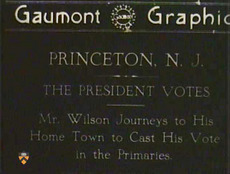 (For a photo of Wilson arriving by train, see the Historical Society of Princeton’s photo archives). During this visit, which is described in the Prince, Wilson participated in the planting of trees along the Lincoln Highway under the auspices of the New Jersey Federation of Women’s Clubs. 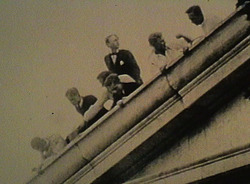 It is not known on what occasion the historic footage was copied onto the 16mm film reel on which it was found, though it must have happened after June 1940, when the footage of Hibben’s inauguration was displayed at the 25th reunion of the Class of 1915, whose members had witnessed the inauguration as freshmen. (On May 17, 1940 Everett Frank ’15 wrote Don Griffin, Secretary of the Graduate Council, that he had located the newsreels, which Griffin was welcome to borrow). The Woodrow Wilson footage on the reel is followed by the commencement activities of what seems to be the Class of 1928. That, and related footage, will be the subject of a future blog. This footage on this 16mm film is part of the University Archives’ Historical Audiovisual Collection (part of item no. 0192). These newsreels are extremely rare for showing Woodrow Wilson in Princeton. Thank you for making them available for all of us. You say, “The newsreels that follow show US President Woodrow Wilson, Hibben’s predecessor, when he returned to Princeton to vote in 1913 or 1915 and in 1916.” See below where I argue for dates of 1915 and 1918, instead. You say, “This footage may have been from Wilson’s visit on September 28, 1915 [or] September 23, 1913.” I would argue for September 1918: note what is apparently a World War One service flag at 2:36. Still photos at AC117 box 242 (wrongly dated) show exactly the same secret service delegation; I believe these are from Sept. 1918. You say, “The very brief footage that follows at 3:15, showing Wilson greeting women, was taken when he voted in the NJ primary on April 25, 1916.” In fact I believe this shows his visit of October 1915 (when he made an historic pro-suffrage vote), during which visit he wore identical clothing to what is shown in the newsreel and, in addition, Doctor Grayson wore identical clothing (based on still photos at AC117 box 242, one of which even shows the newsreel cameraman).